Nothing is more adorable than a puppy. 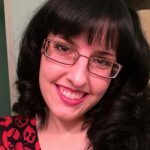 As you’ll quickly learn, however, puppies are not just adorable – they are also a lot of work. The first year of your puppy’s life will shape it into the adult dog it will become. Training starts as soon as you bring your puppy home and the food you feed it will determine its long-term health and wellness, so choose wisely! Keep reading to learn everything you need to know about your puppy’s nutritional requirements and to receive some tips for picking the best dog food to meet them. You’ll also receive our top 5 picks for the best dog food for puppies. 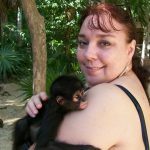 Are There Special Dietary Needs for Puppies? Depending on your puppy’s breed, it may reach its adult size within six months. 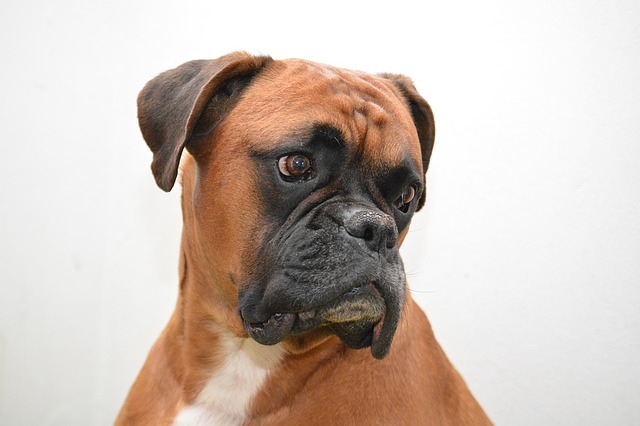 Some breeds, on the other hand, may not be full-grown until they are over a year old. In either case, it is absolutely essential that you provide your puppy with a high-quality, properly balanced diet to ensure that it grows at the right rate for optimal health and wellness. Protein-Rich. Your puppy will grow very quickly during its first year of life and protein is essential to help it develop lean muscle mass. Look for high-quality animal proteins and a crude protein content of at least 22%, ideally higher. Healthy Fats. Not only do healthy fats provide your puppy with a concentrated source of energy but certain fatty acids like DHA support brain development as well as healthy skin and coat. Nutrients. Natural sources for key nutrients are best, but synthetic supplements like chelated minerals are good as well because they are easier to absorb and utilize. Size Specific. 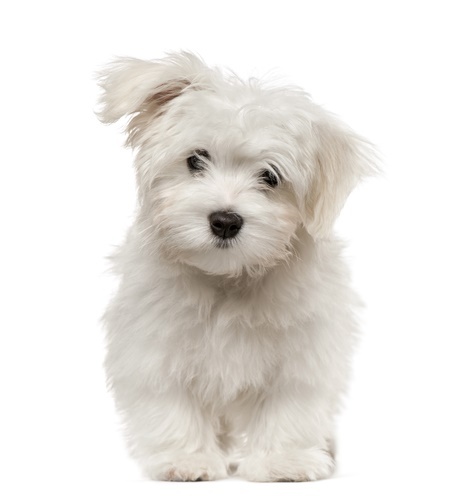 Small breed puppies have higher energy requirements than large-breed puppies. Plus, you want to control the growth of large breed puppies and control their calcium and phosphorus intake as well to protect them from an increased risk of joint problems later in life. When shopping for puppy food, the most important thing to look for is protein. Protein provides your puppy with the building blocks for strong muscles, helping to ensure that it develops lean muscle mass instead of simply getting fat. Your puppy needs a minimum of 22% protein in its diet, though more is always better, and it should come from high-quality animal sources like meat, poultry, and fish. The next most important nutrient for puppies is fat – they need at least 8% in their diet. Fat provides a concentrated source of energy for puppies as well as essential fatty acids that support brain development as well as healthy skin and coat. Animal-based fats like chicken fat and salmon oil are the best, though plant-based fats like flaxseed and canola oil can help ensure a balance of omega fatty acids. Puppies do not have specific needs for carbohydrates, but digestible sources provide energy as well as dietary fiber and essential nutrients. Look for a puppy food that contains no more than 5% fiber because too much fiber can actually upset your puppy’s digestive system. Some puppies are able to tolerate whole grains while others do better on grain-free diets – you’ll need to see what works for your puppy. Keep reading to see our top 5 recommendations for the best dog food for puppies. The best dog food for puppies will be rich in high-quality protein and healthy animal fats. It should be made with all-natural ingredients and formulated for your puppy’s breed size as well. This is the easiest way to ensure that it grows at the right rate and gets all the nutrients it needs. 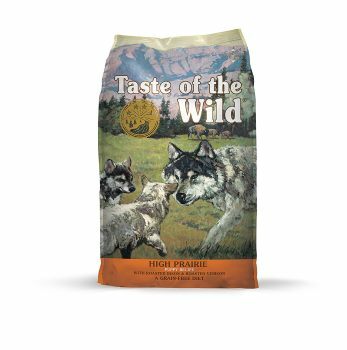 If high-quality ingredients are your priority, this Taste of the Wild High Prairie Puppy Food is a great option. Made with premium roasted meats and grain-free carbohydrates, this protein-rich recipe is just what a growing puppy needs. Not only is it loaded with protein and healthy fats, but it is supplemented with DHA for brain development, antioxidants for a healthy immune system, and probiotics for digestion. Buffalo, Lamb Meal, Sweet Potatoes, Egg Product, Pea Protein, Peas, Potatoes, Canola Oil, Tomato Pomace, Roasted Bison, Roasted Venison, Beef, Flaxseed, Potato Fiber, Natural Flavor, Ocean Fish Meal, Salmon Oil (A Source Of Dha), Salt, Dl-Methionine, Choline Chloride, Taurine, Dried Chicory Root, Yucca Schidigera Extract, Tomatoes, Blueberries, Raspberries, Dried Lactobacillus Plantarum Fermentation Product, Dried Bacillus Subtilis Fermentation Product, Dried Lactobacillus Acidophilus Fermentation Product, Dried Enterococcus Faecium Fermentation Product, Dried BiFidobacterium Animalis Fermentation Product, Vitamin E Supplement, Iron Proteinate, Zinc Proteinate, Copper Proteinate, Ferrous Sulfate, Zinc Sulfate, Copper Sulfate, Potassium Iodide, Thiamine Mononitrate (Vitamin B1), Manganese Proteinate, Manganous Oxide, Ascorbic Acid, Vitamin A Supplement, Biotin, Niacin, Calcium Pantothenate, Manganese Sulfate, Sodium Selenite, Pyridoxine Hydrochloride (Vitamin B6), Vitamin B12 Supplement, RiboflAvin (Vitamin B2), Vitamin D Supplement, Folic Acid. If you’re looking for an affordable brand of puppy food that will still meet your puppy’s needs, try this Nature’s Recipe Grain-Free Puppy Food. Made with real chicken and potatoes, it contains 25% protein and 14% fat, plenty for a growing puppy. This recipe contains antioxidant-rich fruits and vegetables but is completely free from corn, wheat, and artificial additives. 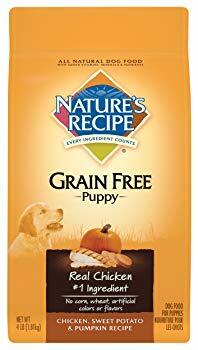 Plus, it is naturally grain-free which makes it a great option for puppies with allergies or food sensitivities. Chicken, Chicken Meal, Garbanzo Beans, Peas, Pea Protein, Poultry Fat (Preserved with Mixed Tocopherols), Sweet Potatoes, Apples, Pumpkin, Tapioca Starch, Natural Flavor, Dried Tomato Pomace, Salt, Potassium Chloride, Dried Algae, Choline Chloride, Vitamins (Vitamin E Supplement, L-Ascorbyl-2-Polyphosphate (Source Of Vitamin C), Inositol, Niacin, D-Calcium Pantothenate, Vitamin A Supplement, Riboflavin Supplement, Thiamine Mononitrate, Beta-Carotene, Pyridoxine Hydrochloride, Vitamin B12 Supplement, Menadione Sodium Bisulfite Complex, Vitamin D3 Supplement, Folic Acid, Biotin), Taurine, Minerals (Ferrous Sulfate, Iron Proteinate, Zinc Proteinate, Zinc Oxide, Copper Sulfate, Manganese Proteinate, Copper Proteinate, Manganous Oxide, Calcium Iodate, Sodium Selenite), Lactic Acid, Citric Acid (Used As A Preservative), Yucca Schidigera Extract, Rosemary Extract. Small breed puppies need an extra boost of energy to fuel their fast metabolisms and speedy growth. 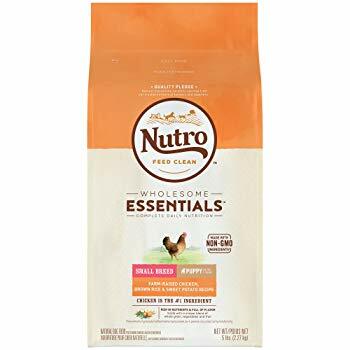 This Nutro Wholesome Essentials Small Breed Puppy Food is just what a small breed puppy needs for optimal growth and development. Made with farm-raised chicken, brown rice, and sweet potatoes, this formula is protein-rich, highly digestible, and full of natural flavor. All puppies need a protein-rich diet but large-breed puppies need to have their growth controlled to prevent joint problems later in life. 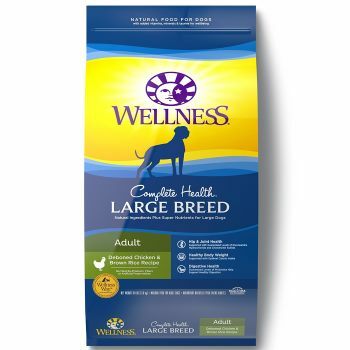 This Wellness Complete Health Large-Breed Puppy Food is uniquely formulated for large breeds to ensure slow and controlled growth and healthy bones and joints. It features deboned chicken and brown rice as the primary ingredients and is supplemented with DHA, chelated minerals, and probiotics. 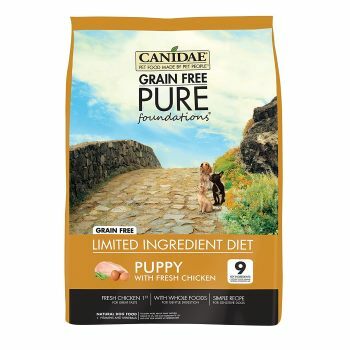 If your puppy is sensitive to grains or you suspect food allergies, a limited ingredient diet like this Canidae Grain-Free PURE Limited Ingredient Diet Puppy Food might be a good choice. Made with protein-rich chicken and a select number of other healthy ingredients, this recipe is just what a growing puppy needs. It’s also supplemented with chelated minerals and probiotics. When it comes to feeding your puppy, you need to consider its breed size to determine how much is appropriate. 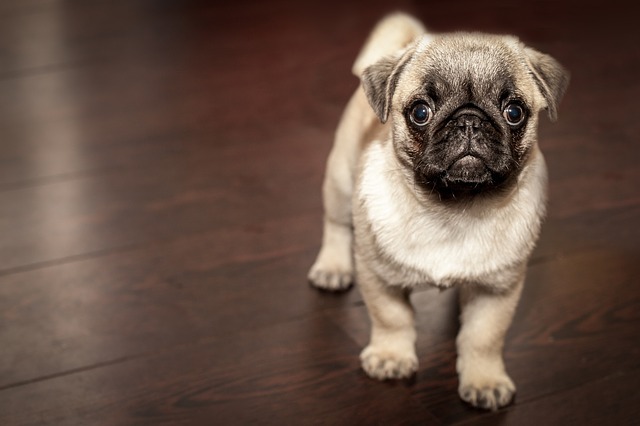 Small breed puppies will grow very quickly no matter what you feed them, and you should feed them 4 times a day for the first three months and then reduce to three daily feedings after that. Large-breed puppies may do better with three meals a day for the first three months then reduce to twice daily feedings after that. In terms of how much to feed your puppy, it depends on the calorie content of the recipe you choose. Refer to the feeding recommendations on the package and choose the right amount according to your puppy’s age and weight. Keep in mind that the feeding amount will change as your puppy grows, so check the package often and make adjustments as needed. You can also ask your veterinarian for recommendations if you aren’t sure whether your puppy is growing at the right rate. When your puppy is young, it may be difficult to tell whether it is allergic or sensitive to any of the ingredients in the food you’ve chosen. If your puppy develops skin problems or chronic ear infections, it could be a sign of food allergies. If your puppy suffers from frequent diarrhea or vomiting, it could be a food sensitivity or something more serious, so consult your veterinarian. If you suspect that your puppy has a food allergy or sensitivity, it may be wise to switch to a limited ingredient diet. These formulas are made with a low number of main ingredients to reduce the risk for triggering food allergies and sensitivities. They are often made with novel sources of protein and carbohydrate as well – this simply means a type of protein and carbohydrate your puppy is less likely to have eaten before. In some cases, just switching to a grain-free formula may do the trick. The dog food you choose for your puppy should be the highest quality food you can consistently afford. Look for a protein-rich formula made with animal proteins and healthy fats with plenty of essential vitamins and minerals. If you’re not sure where to start, try one of the 5 best dog foods for puppies that we’ve reviewed above.